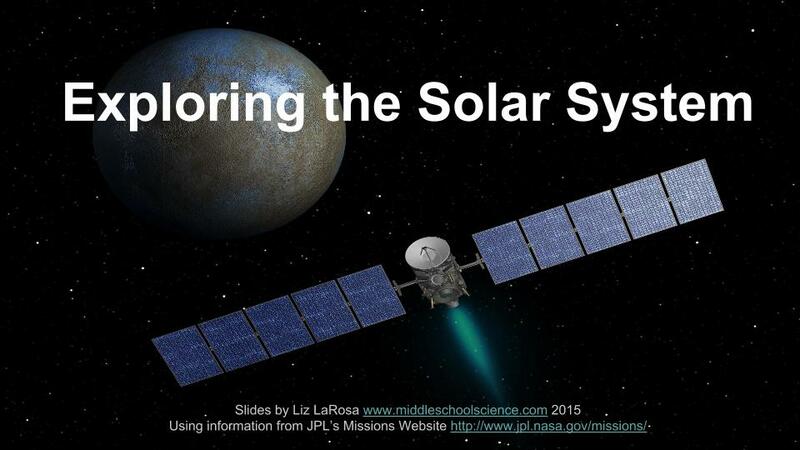 After taking an in-depth look at missions to Mars (blog entry) and learning more about the planets in the solar system (blog entry), we learned about past, present, and future unmanned space missions and their mission objectives. Each group of students created a shared Google Slides Presentation, and within each group, students were assigned 4-6 numbered slides with specific missions (public link). This was a great way for the students to learn about different missions, practice their research, tech, and collaboration skills, and to get a better understanding of the history of unmanned space missions. When students were done with their slides, the next class involved a fun game of “Name that Mission” (girls vs boys). Using slides that the students created, I pulled a total of 20 or so slides from different groups and classes and added animations to them. If they could name the mission without clues (just an image of the spacecraft) they earned 2 points, if they named the mission with clues, they earned 1 point. Below is a video about DAWN – the mission will be arriving at Ceres this week (March 6th) narrated by Leonard Nimoy. LLAP.